Pregnancy - All About Health, Inc. It is difficult to comprise a list of essential oils that are to be avoided during pregnancy as there are several different opinions available. However, some general guidelines to follow are to never use an essential oil that has been adulterated. These recommendations apply to therapeutic-grade oils only. Oils that are diluted in a carrier oil or that are used externally and in moderation should not have an adverse effect. Consult your doctor, pharmacist, herbalist or other health specialist if you have any questions. Some experts say that some of the oils listed to avoid during the first 8 months of pregnancy are safe to use after that period of time. Sage and Fennel are two excellent oils for strengthening the womb and for Braxton Hicks contractions. Angelica, Cedarwood, chamomile (German/Blue), cistus, citronella, clary sage, clove bud, cumin (Black), cypress, davana, fennel, jasmine, laurel, lemongrass, marjoram, Mountain savory, myrrh, nutmeg, peppermint, rose, spearmint, thyme, vetiver, yarrow. After Childbirth: Cypress and Lavender in a bath. Cypress to staunch blood flow; lavender to heal the wound. Use the following chart with the precautionary information above. 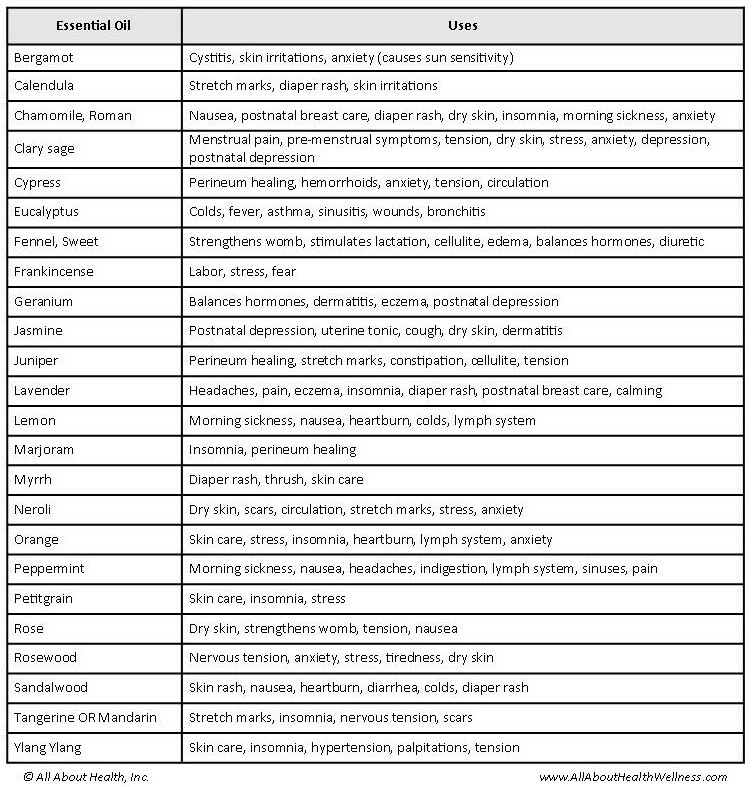 Click here for a printable version of essential oils for pregnancy and childbirth. The information contained herein is no way intended to replace the advice of a qualified medical doctor. The statements have not been evaluated by the Food and Drug Administration. Information provided is not intended to diagnose, treat, cure, or prevent any disease.